I always think that consistency is key in a book, document, paper, flyer, etc. So what about on the front of a pub? Yes, there too. 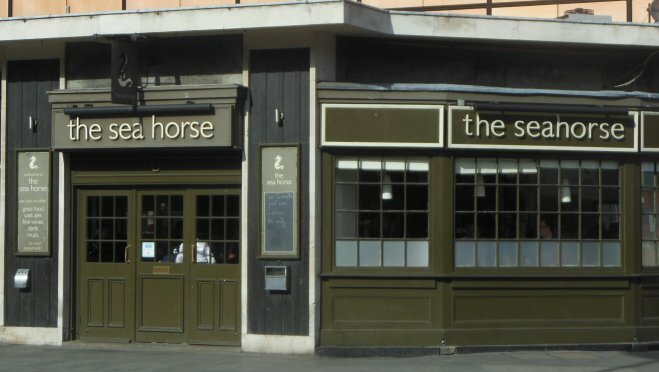 Yet this pub in London seems to have a split personality, �the sea horse� on one side becoming �the seahorse� on another. Sea horse � two words � is technically correct, but, one way or another, let�s be consistent. As for the lower case throughout � don�t get me started. How do you proofread hieroglyphics? Translators need proofreaders too Should we believe what we read? Ref: 165 That pub must have changed hands and they forgot to correct it on one side - must be a trifle confusing for customers! But yes, inconsistency often seems to be the norm, unfortunately. Ref: 164 Blimey (163) that IS crazy. Ref: 163 Stratford-upon-Avon has a pub with the Dirty Duck on one side of the sign and the Black Horse on the other...true lack of consistency there!